21 September 2010—It’s easy to see why energy companies are pursuing utility-scale solar projects in California. The state is blessed with deserts soaked in sunshine, and it faces a legal mandate to acquire more renewable electricity. But the state is also cursed with a limited water supply. So California regulators are pushing water conservation practices on new plant designs, some of which are costly and can hinder efficiency. Last week, the California Energy Commission approved the construction and operation of four solar-thermal power plants in the town of Blythe, with a planned overall capacity of around 1 gigawatt—the largest such installation yet. But to get the green light, the project developers had to redesign the plants to use a cooling technology that reduces their efficiency by 5 to 10 percent and increases the cost of electricity by 5 to 7 percent, according to Solar Millennium, which is jointly developing the project with Ferrostaal and Chevron. 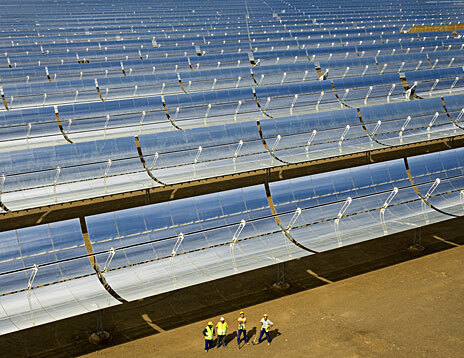 Solar-thermal plants like the ones planned at Blythe use trough-shaped mirrors to warm a heat-transfer fluid pumped through a pipe at the mirrors’ focal point. The hot fluid makes steam to turn a turbine and generate electricity. The steam must be cooled and condensed to complete the cycle. And in most solar-thermal plants, such as Solar Millennium’s massive Andasol plants in Spain, that requires a cooling tower that carries the heat away by evaporating water. On average, a typical 300-megawatt steam-cycle generator with cooling towers loses some 11 million liters of water a day to evaporation. However, plants can use dry cooling—essentially a gigantic radiator—instead. “Because we are cooling the steam cycle of the turbines with air instead of water, we require 90 percent less water,” says Josef Eichhammer, president of Solar Trust of America, the Solar Millennium-Ferrostaal joint venture. However, dry cooling is less efficient than wet cooling, especially in summer. The turbine’s efficiency is related to the temperature difference between the hot steam and the cooled condensate. Lowering the temperature of the cooled side increases the pressure difference across the turbine, improving efficiency. Because wet cooling relies on evaporation, it can drive down the water temperature to below the temperature of the air outside the plant. Dry cooling can’t. Blythe, where the plants will be located, is in California’s southeastern desert, just a stone’s throw from the Colorado River. But waters from the lower Colorado are already in high demand, with farmers, cities, and energy producers competing for it. And the area’s groundwater sources are limited. The Blythe plants were originally supposed to be wet cooled, but Solar Millennium changed the design because “the California Energy Commission prefers dry-cooled generation,” says Rachel McMahon, director of government affairs for Solar Millennium. According to the report, the entire project will use 740 megaliters of water per year for things such as washing the mirrors (283 ML) and supplying a fire suppression system. So the plant will provide its estimated 2200 gigawatt-hours of electricity for a miserly 363 liters per megawatt-hour. The water will come from wells to be drilled on-site. New renewables projects, like Blythe, are critical to California, because state law mandates that 20 percent of utilities’ electricity be renewable in 2010. By 2020 it must be 33 percent. The California Energy Commission is rushing to complete its review of a raft of solar projects before an offer for federal grants and loan guarantees expires at the end of the year. Last month, the commission approved the Beacon Solar Energy Project at the western edge of California’s Mojave Desert. Despite the desert environment the 250-MW plant is a allowed to consume 1.7 billion liters per year in a wet cooling system, because it will use treated municipal wastewater from nearby California City. The next hurdle for the Blythe plants is U.S. Bureau of Land Management approval, which Solar Millennium expects to happen in October. The company plans to start construction of the first two of the four plants in 2010 and should have them connected to the grid in 2013 and 2014.